COBBLE HILL – Dozens of fourth graders at Success Academy Cobble Hill participated in the school’s first-ever Empty Bowls fundraiser to help feed hungry New Yorkers. Students of Sarah Mallory’s art class and members of her art club started the project back in September, using the pinch pot method to handcraft food-safe ceramic bowls and glazing them in the art room’s kiln. 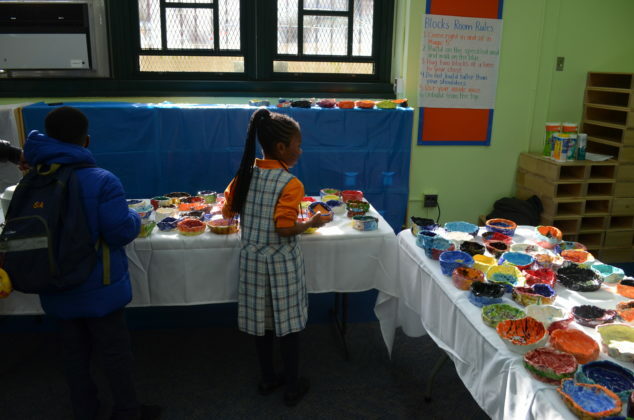 The hardworking students, and some faculty, created 215 colorful bowls which they sold for $5 each at a potluck lunch Wednesday afternoon. 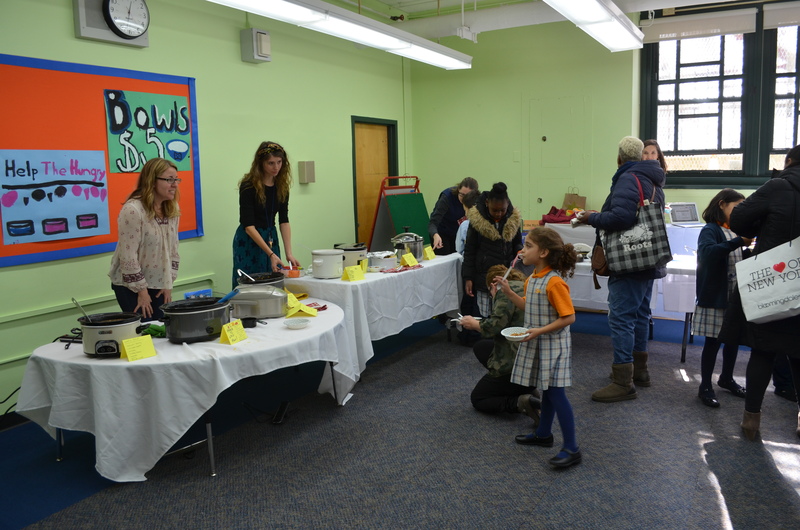 All funds raised from the sales of the bowls will benefit Food Bank For New York City. 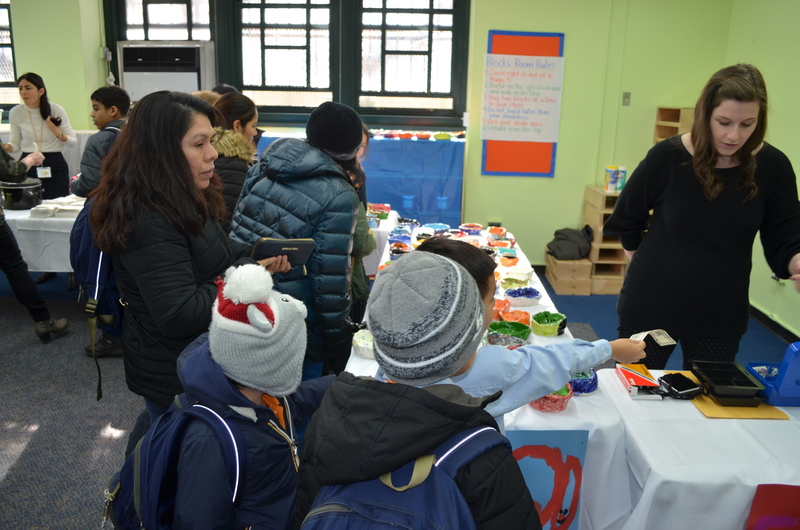 “The way that the event works is you can come and buy a kid-made or staff-made ceramic bowl to eat out of for $5,” Mallory explained. 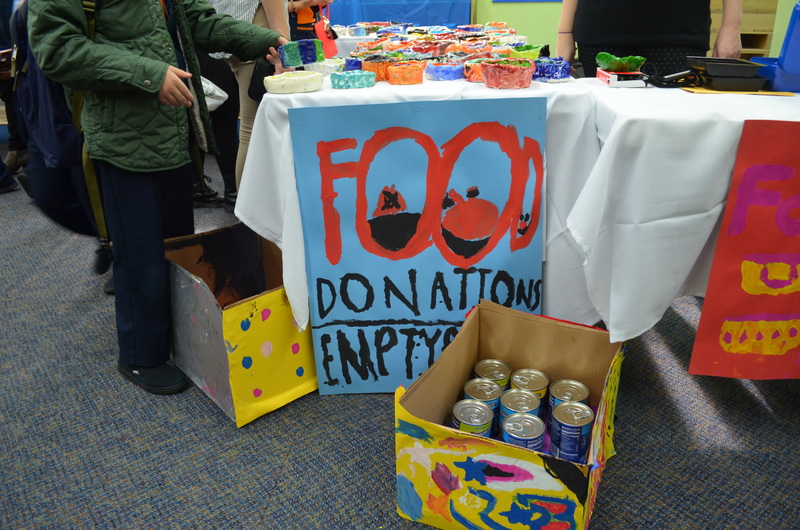 “All the money that we raise from the artwork sales is going to go to Food Bank For NYC.” The school also collected non-perishable food items for the organization at the event. 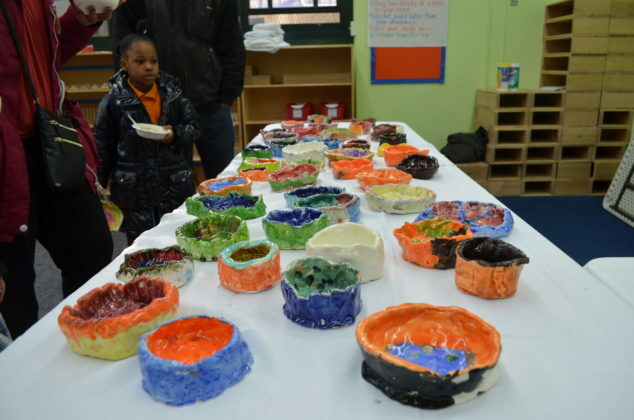 The Empty Bowls program was founded in Michigan in the early 1990s by artist/educator couple, John Hartom and Lisa Blackburn, and their high school students. 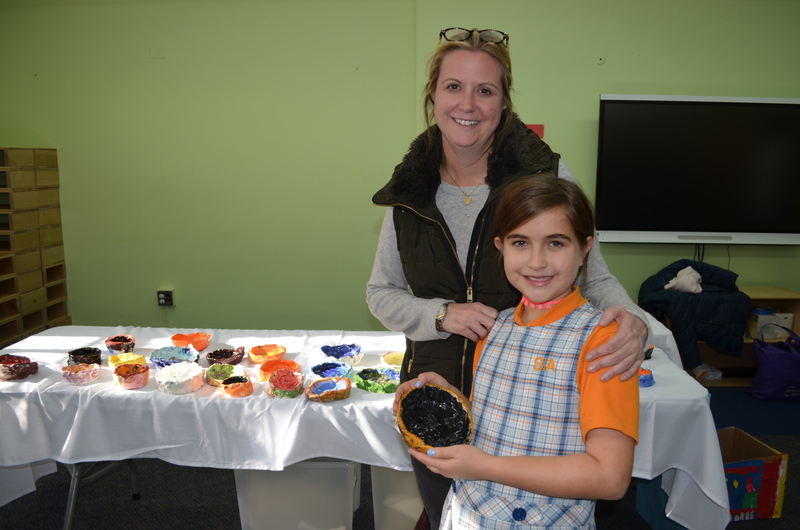 Empty Bowls is an annual event in which potters and ceramic artists create a variety of bowls to sell to raise funds for local organizations dedicated to addressing food insecurity. Read about two other Empty Bowls events happening this Saturday in Brooklyn here. 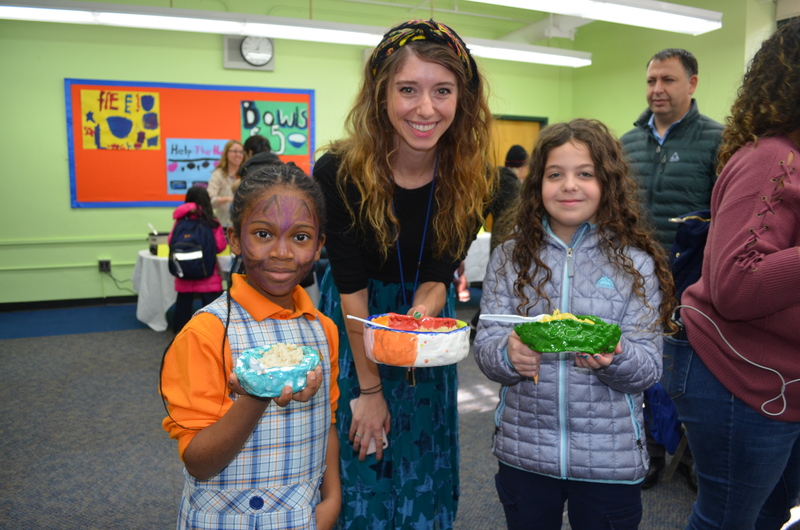 Eight-year-old Ella Isik made about eight bowls for the event. “We made these bowls and all the money we get we’re going to give to Food Bank. The Food Bank gives food to people who don’t have food,” she said. “It was very fun. 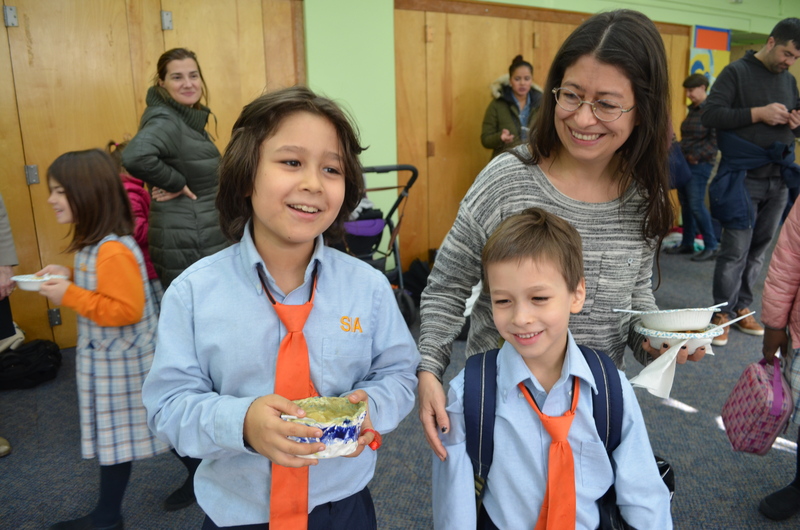 It was a joyful experience,” said nine-year-old Elias Rabinovich as he ate his mom’s chicken soup from a bowl of his own design. “We made these to donate to the food bank so that people with no food can get food…the food bank actually needs to buy the food so that they can give it to the homeless and people who don’t have kitchens,” he explained. Congratulations to Ms. Mallory and her students who raised $685 at today’s event.